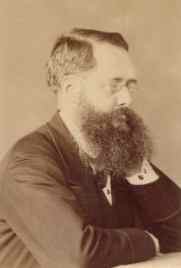 William Wilkie Collins was born in London on January 8, 1824, the oldest son of a fashionable artist. He was named after Sir David Wilkie, a friend of the family. After an early career in business, he studied law and was admitted to the bar, though he apparently never practiced. He also tried his hand at painting, and wrote many articles and stories that were published anonymously. A biography of his father was his first major published work, the success of which encouraged him to write for a living. His first novel, a historical work called Antonina or The Fall of Rome, was published in 1850. In 1851, Collins was introduced to Charles Dickens by a mutual friend. The two formed a lasting friendship, and worked together on Dickens’s magazines, Household Words and All the Year Round, where many of Collins’s works appeared in serial form. Collins was one of the pioneers of the mystery and suspense genre, and his most famous novels include The Woman in White and The Moonstone. The latter was mostly dictated while he was bed-ridden and suffering from gout. He died in 1889. A young girl who lives in fear of the return of a man she betrayed. Following the mysterious murder of her husband, Mrs. Ferrari receives an envelope from Venice that contains one thousand pounds. Emily befriends Francine, a schoolmate and tells her the story of her father's death. A teacher approaches, claiming to have known the man, and Emily begins her search for the truth regarding her father's mysterious death. Valeria has married who she thinks to be Eustace Woodville, but finds out that his true name is Macallan. When no one will explain or answer her questions, she sets out to discover the truth herself. A woman who has promised to marry a man begins to wonder if she isn't already married to his friend. Critiques the ideas and conventions of Victorian society. A detective mystery about the theft of a diamond from a shrine in India. A tale about the Jockey Club, the betting-ring, and a robbery. During the war between England and France, Grace, is killed and Mercy, a convict, assumes her identity. Magdalen Vanstone, an illegitimate child, struggles to reclaim her identity. Follows Frank Softly who is sent by a snobbish, but poor father to boarding school in the hopes of making a life for his son. After a time, Frank falls in love with the daughter of a doctor, only to find out that the doctor makes counterfeit coins. He is recruited to help, and after a series of misadventures, runs away with the doctor's daughter to Scotland and marries her. The law follows, and Frank is arrested and sent to Australia. After he is released, he is a rich man. George traces the whereabouts of Mary, his childhood sweetheart, but Mary is recovering from a serious illness that changed her appearance. A drawing teacher, Walter Hartright, meets a mysterious woman in white, and stumbles upon a deadly scheme by Count Fosco.